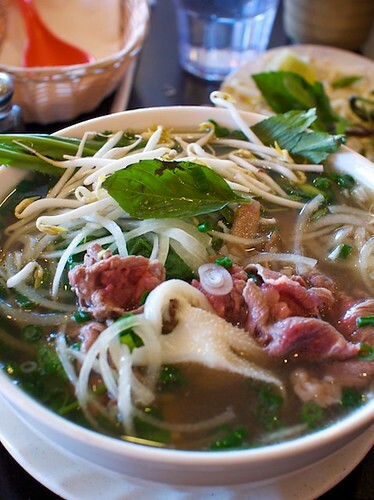 If it were west of the 5 freeway, a Vietnamese restaurant that serves kobe beef pho would be a sign of gentrification. But since it’s on the other side, in the San Gabriel Valley to be exact, it’s a sign of something different. Some would say it’s the sign of the rising upper middle class with the disposable income to order a $10+ bowl of pho. I would say it’s the sign of people who live in the SGV willing to pay a little extra for higher quality food. Noodle Guy sits in the space that used to be Mei Lin Tou Jiang. The now defunct soymilk and northern Chinese breakfast place has been remodeled with vinyl booths lining the windowed walls and a state of the art POS system that the trendy young waiters use to punch in your order. Typically, I’m wary of things more high tech than a pen and a pad of scrap paper at a restaurant in the SGV, but those fears were put aside when the big bowl of pho was brought to me. I ordered the ubiquitous #1 pho bowl, which my dad refers to as the “train engine car” because that’s what you feel like hit you after finishing that bowl. 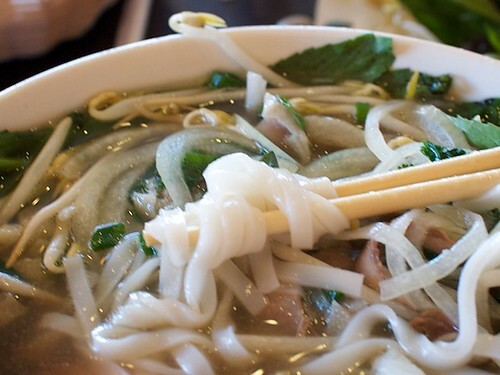 Although it’s not mentioned on the menu, you can ask for a substitution of kobe beef instead of regular beef for the price of practically another bowl of pho. #1 comes with slices of beef, plenty of tendon, crispy, and chewy tripe (my favorite!). The rice noodles at Noodle Guy are wider than the usual ones served in pho, but not as wide as say, the rice noodles in pad see ew. The thicker noodles make sense because the broth is so rich and has such a creamy mouth feel, thanks to the tendon and other morsels melting into it, that a thinner noodle would do a poor job of complimenting the soup. So is the extra charge for kobe beef worth it? Well, when I first heard about it, I thought it was a waste of kobe beef. Then I thought it was gimmicky. But after my first bite of the thinly sliced, barely cooked, premium beef in my bowl of soup, I was singing a different tune. The beef was tender without being mushy and had a particular taste that I hadn’t had before in the usual bowl of pho. It was beefy, but not in an artificial or perverse way. It tasted like a farm — fresh air, green fields, dirt path, everything. This was a good thing. 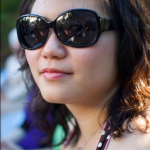 Would I order the pho with kobe beef again? Unless I were really hankering for it, probably not. That’s not to say the beef wasn’t good. It was very, very good. But so was everything else. The broth was spicy with anise and carmelized onion. The noodles were perfectly cooked and still had a nice chew for rice noodles. The tendon was buttery and melted in my mouth. The tripe was easily chewable and not overcooked. The bowl was perfect without the need for kobe beef. As a whole, I liked this bowl better than the pho at Golden Deli. I prefer the wider noodles served at Noodle Guy. I also like that it’s not always mobbed like it is in GD. The soup at Noodle Guy is a little more spiced and maybe sweeter than GD, but still pretty good. I am confused: Is this a proper Japanese dish or is it a vietenanese dish? It is a Vietnamese dish using Japanese-style beef.